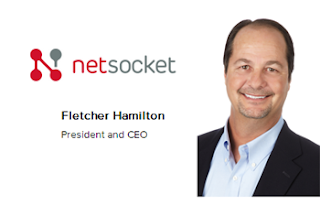 Netsocket named Fletcher Hamilton as its new president and CEO, replacing John White, who for the last 2 years led the company’s transformation into a key and innovative technology provider within the SDN market space. Fletcher Hamilton joined Netsocket last year from Acme Packet, where he was vice president of enterprise and government sales and a founding member of the enterprise sales team. Netsocket has also appointed Tricia Hosek as chief operating officer. She joined Netsocket in early 2012 following a series of high growth and profitability achievements spanning early stage start-ups through multi-billion dollar operations, most recently with Enfora as chief operating officer and Tekelec as President/GM of the Switching Solutions group. 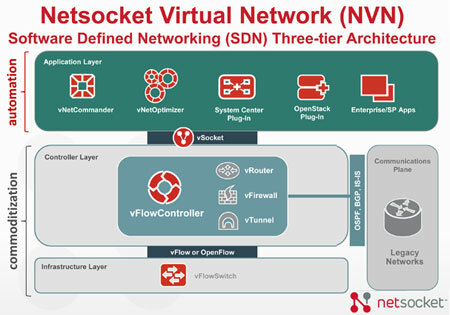 In July, Netsocket, a start-up based in Plano, Texas, unveiled its flagship Netsocket Virtual Network (NVN) product suite for bringing SDN-based orchestration and automation capabilities to enterprise infrastructure based commodity x86 servers. Netsocket has developed a three-tier SDN architecture for interoperability and integration with legacy routed networks as well as higher level management systems such as Microsoft System Center. The NetSocketdesign uses a vFlow controller with routing, firewall, and VPN capabilities built-in. vFlowController -- an SDN controller with intrinsic vRouter, vTunnel and vFirewall components. vNetCommander -- a centralized management system for NVN that handles automated installation, provisioning and orchestration of the network. vNetOptimizer -- a next generation virtualized version of Netsocket’s Cloud Experience Manager service assurance product, and will provide for real-time network service analytics, automation and optimization of the network. In April, Netsocket raised $9.2 million in Series B funding for expansion of it network assurance expertise into SDN. The funding round was led by new investor Venture Investors, with participation by existing investors Sevin Rosen Funds, Silver Creek Ventures and Trail Blazer Capital. Netsocket was founded in 2007. Its team includes key players from Chiaro Networks, a Richardson, Texas-based start-up that developed a high-capacity core router for the service provider market. Mignon Clyburn, acting Chairwoman of the FCC, is urging mobile operators to adopt consumer-friendly cell phone unlocking policies. In a statement, she writes that months of meetings with carriers and trade association has yet to result in an industry-standard policy for unlocked devices. Her statement says a voluntary approach is still possible but implies new regulations might also be pursued. "I support policies that enable consumers to lawfully unlock their mobile telephones, so they can seamlessly move from one carrier to another. While wireless carriers should be able to enforce their valid customer contracts, the unlocking provisions need to be grounded in common sense and practical application. Consumers, who satisfy the reasonable terms of their contracts, should not be subject to civil and criminal penalties if they want to take their device to a new carrier." competition and consumer choice is still possible." "Some providers have already adopted consumer-friendly cellphone unlocking policies, and I applaud them. The FCC, industry, and other stakeholders should continue to work towards an industry-wide cellphone unlocking solution that best serves the public interest. Therefore, I've directed the FCC staff to redouble our efforts with partners across the administration and industry to explore all of our available options for a quick resolution." Huawei has secured a US$1.5 billion equivalent 5-year term loan and revolving credit facilities. The dual-currency vacilities comprise a US$750 million equivalent term loan, and a US$750 million equivalent revolving credit facility, which are available in both USD and EUR with the EUR tranche capped at EUR300 million. Huawei said the funds will be used for the general corporate purposes of the company and / or to refinance the existing indebtedness of the company. "Huawei continuously strives to create diverse financing channels to maintain our financial flexibility, and this Facility will boost our efforts to accelerate business development and build on our global presence so that we can continue to create value for our customers around the world," said Ms. Cathy Meng, Chief Financial Officer of Huawei, "This is the largest amount of overseas loan and credit facilities Huawei has raised to date. We are pleased by the strong support received from leading international banks as this highlights the trust and confidence that the financial community has in Huawei’s sustainable growth and globalization strategy." In July, Huawei reported unaudited revenues of CNY 113.8 billion for the first half of 2013, an increase of 10.8% over the same period in 2012. Huawei expects to generate a net profit margin of 7-8% in 2013.